Scouring the internet for new straps to feed my addiction has introduced me to a ton of new strap makers located all over the world. 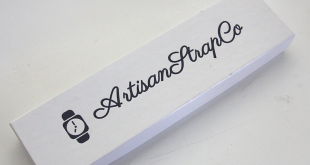 From Indonesia to Europe there are amazing strap makers that are feeding a now booming industry. Recently I came across another strap maker that is actually located here in the states and had some interesting and quality looking straps I wanted to get my hands on. I reached out to David of David Lane Designs in New York to set up some straps to review. 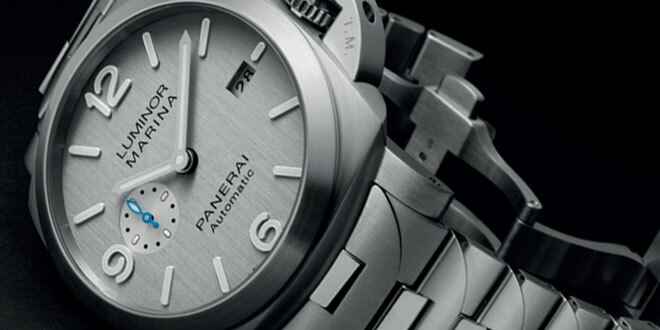 David was kind enough to send out a couple of his signature pieces for Panerai Central to review. The second review for David Lane is a 1960’s Swiss black army strap made from vintage Gaiters made in Alpina, Switzerland. As with the first David Lane strap I received this strap in a custom-made wooden box with the David Lane Design crest burned in it. This is how all of his straps are sent out which adds a very nice touch to an already amazing strap. Taking a look at the strap you will immediately notice the character in the beautifully aged Swiss leather. Even with the strap being black you can easily make out the texture from a good distance. It almost looks like a very fine gator print on the longer tail part of the strap. 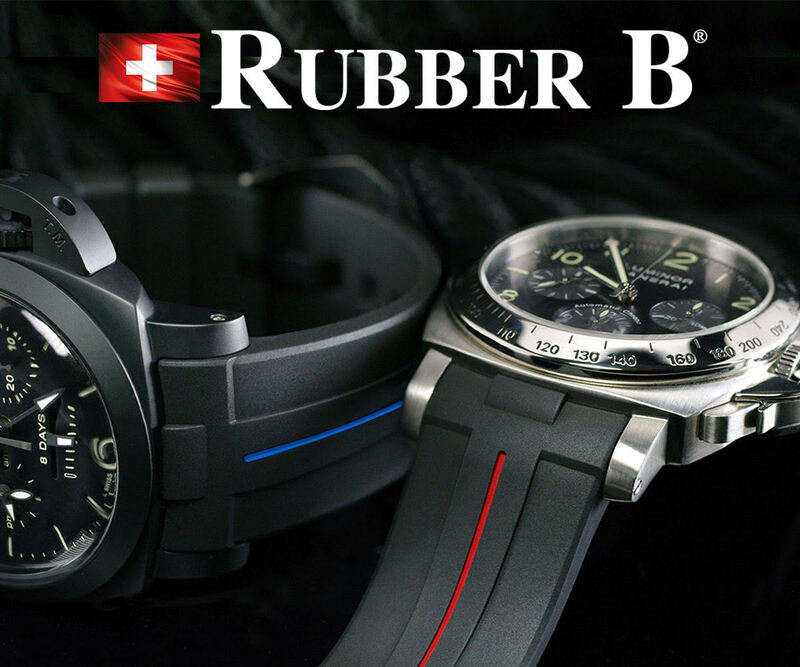 The strap is a two layer design that measures 4mm thick all the way through. The keeper end towards the lugs is a bit thicker at 5mm and then tapers down to the same 4mm which is present on the tail end of the strap. There is one sewn in keeper along with a floating one. 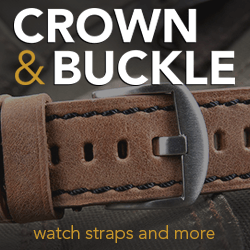 The underside of the strap is a very smooth lighter brown that is stamped with the David Lane crest on the buckle end and a made in the USA logo on the tail side. The edges of the straps are hand burnished and created a very smooth finish. You can look at the edges up close you will be hard pressed to find the seam. 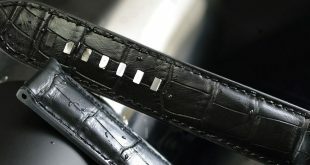 The edges are made so well that it looks like one piece of smooth leather is used to make this strap. The strap is full stitched with an ecru colored thread that contrasts nicely with the aged black leather. The stitch color really gives the strap a more aged and dirty look. I don’t think any other stitching would have worked as nice as this one does. The stitching is done with great precision even though it has been stitched by hand. 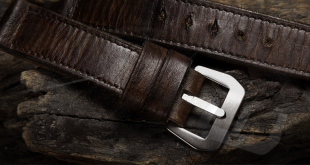 The strap is finished off with a GPF-Mod Dep sewn in buckle that works very nicely with the history of this strap. The strap has one fixed keeper that is sewn in and one floating one that can be removed if needed. One side note that you should be aware of which I learned in regards to David Lane Straps. 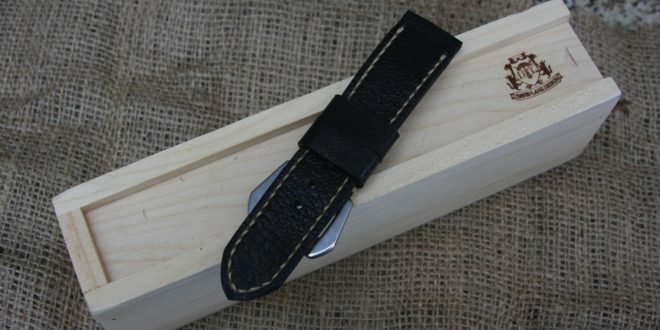 The width of the strap is going to arrive slightly thicker than the actual width you need. At first I thought that there was a mistake because I had to actually wiggle the strap into place to place the pins through it. After speaking to David, he mentioned that this was done by design in order to have a nice snug fit, because over time the strap will rub and wear down to the point where it fits perfectly. Since leather gets molded and conforms he wanted to make sure that over time there would not be a gap. This strap is on the softer side when it comes to stiffness. The strap was very easy on the wrist and molded nicely around even on the first wear. After numerous sessions on the Panerai I can safely say that the strap is very comfortable all the way around. Keep in mind that there are many different types of leather that David uses to create his custom straps. Some French leather is very soft, with a heavy patina, cuts, scrapes and stains, which can all be requested. Other custom straps can be firm and new similar to the one I received. The great thing about getting any type of military leather made into a strap is there is a great variance from one strap to another. The build on this David Lane custom strap is definitely top notch quality. From the stitching to edges David has taken a good amount of time to ensure that his product is high quality. I don’t see any large technical flaw that would destroy the longevity of the strap, but of course only time will tell. Overall I like this strap a lot. There are a lot of Vintage Army straps on the market, but the quality of material and build on this David Lane is definitely worth the price and wait. Keep in mind that David also has a Limited Edition collection that uses rarer leathers, so you can get something that is unique. This particular strap falls in his normal leather collection which will run you aboue $225 USD. 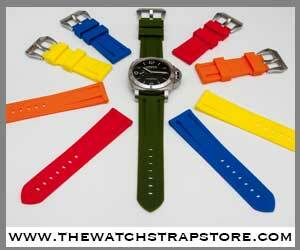 Currently David has a lead time of close to 6-8 weeks because each strap is completely hand-made. I know it seems like a long time but when you receive it you will understand why. David is a one man show that does this for the pure passion of strap making. There are so many choices of components that go into his straps that you might become a bit overwhelmed as I did when selecting the combination of materials and finishes. If you find yourself in my shoes, then just head over to his strap gallery where you can get an idea of different setups he has created in the past. 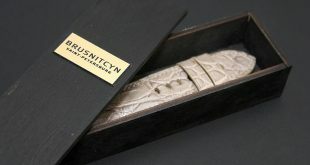 This strap currently will run you $225 USD plus shipping and comes with a custom-made wood case for it. All of David Lane Design straps are made to order.